His team was absolutely dominated, but Alex Lyon came to the rescue. 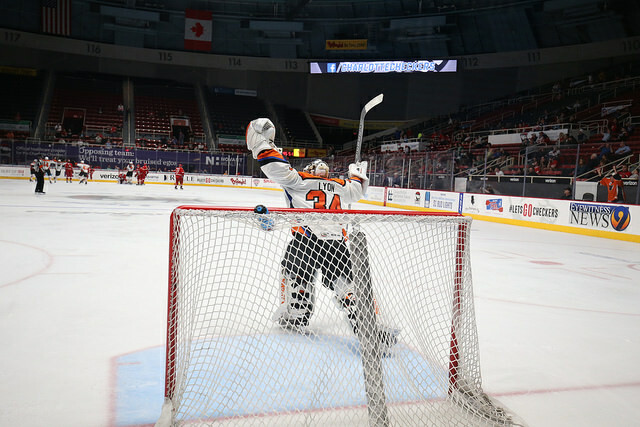 The tweet above calls Alex Krushelnyski the hero of last night’s Lehigh Valley Phantoms–Charlotte Checkers five-overtime AHL playoff game. With all due respect to Krushelnyski, he wasn’t. There’s no way the game even gets to overtime if Lehigh Valley goalie Alex Lyon doesn’t do what he did. Lyon made 94 saves on 95 shots in nearly 147 minutes in net. His team was out-shot by a wide, wide margin, 95–53. Lyon gave up a game-tying goal early in the second period and then saved the next 79 shots, a span of 119:56 seconds of shutout hockey. The game was, not surprisingly, the longest in AHL history, edging out a 2008 game between the Phantoms (then playing in Philadelphia) and the Albany River Rats by about four minutes. Lyon’s performance in net, though, fell four saves short of tying the AHL saves record Albany’s Michael Leighton set that night. 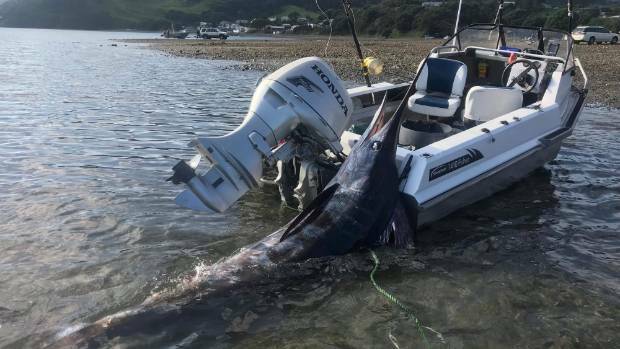 Josh Roberts, a fisherman in northern New Zealand, set out on his little 14-foot skiff last weekend and did something he hadn’t done in his 10 years of fishing: catch a striped marlin. 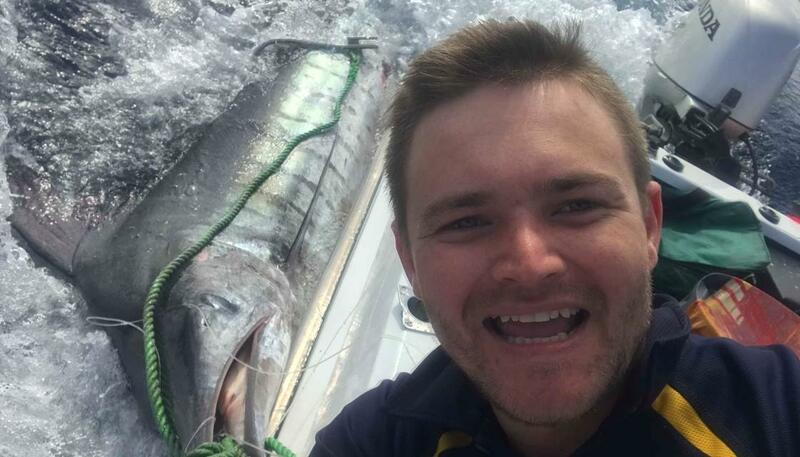 Not only that, the fish the 25-year-old angler hauled in—after a 90-minute battle—tipped the scales at 321 pounds. It was so big, it wouldn’t even fit in his boat. The Celtics beat the Sixers in a thriller last night to advance to the Eastern Conference Finals, setting up a rematch with the Cavs. Out west, meanwhile, the defending champion Warriors will be facing the Rockets, the team with the best regular-season record in the NBA. If you had asked anybody at the start of the season who they thought the last four teams standing would be, 90% of people probably would have given you those four. The problem the NBA has had recently is that it’s been so predictable. But while we could be headed for yet another Warriors-Cavs rematch, I don’t think anyone would complain about getting another chance to see LeBron attempt to drag a group of schmucks to a title. Someone stole the suit from the Iron Man movie. ... John McEnroe says Donald Trump—before he was elected—offered him $1 million to play a match against Serena Williams. ... I always enjoy having a laugh at Darren Rovell’s expense. ... David Price has carpal tunnel syndrome but his manager doesn’t think it’s because of video games. ... It turns out you can’t cook chicken in the dishwasher. ... This PGA golfer is using a ball marker this week worth $2,000. ... A South Carolina high school is threatening to fine families more than $1,000 if they cheer during graduation. All right, so no one actually died, but a Polish highway was closed Wednesday after a tanker hauling liquefied chocolate overturned. It might not seem that bad, but the cleanup crews said the quickly solidifying chocolate was more difficult to remove than snow or even oil. A reporter also lost his shoe in the mess.